Joyce says: Thanks for your well wishes. Yup, hope he’ll be well really really soon! Joyce says: I think I see him peeking back at Rinnah jie-jie! 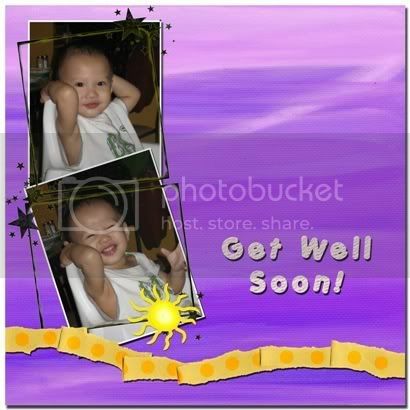 Get well soon Ethan boy, be strong GT! So he closed his eyes? So clever! Joyce says: Yeah, try dropping the eye drops when he does that! Joyce says: Thanks for your well wishes and for coming by. Ethan is feeling so much better now. Oh and of course, thanks for the beautiful doodles! hi, joyce, i’ve sent an email to you regarding where can i get the bumwear in penang. You got the email? Joyce says: I just sent you an email, Soo Ming, because somehow I did not receive your mail. emm…i want to comment on “The Food Monster”, but why still link me to this comment box? why JE jab for Ethan? JE jab necessary in M’sia? Joyce says: I have rectified the error. Thanks for letting me know. The JE jab is optional in Malaysia.